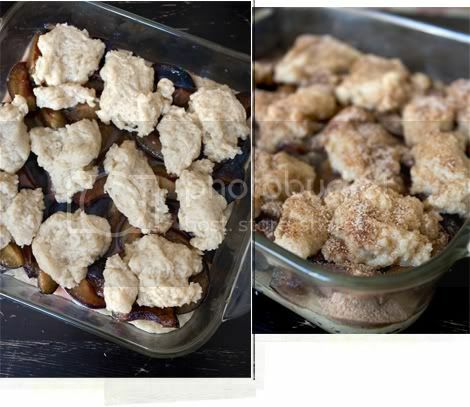 A few weeks ago I received a request to veganize Peach Crisp. I never did post that recipe, but that's because my Peach Crisp requester and I decided that Peach Crisp is too easy to veganize. 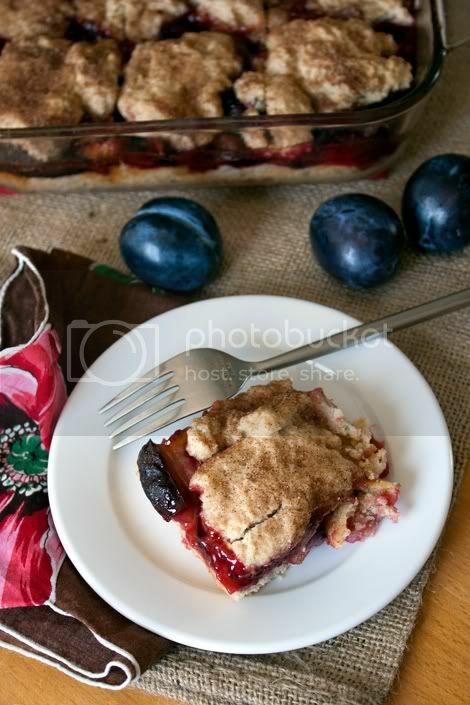 So the recipe morphed into this one: Rustic Plum Pie Coffee Cake; a part pie, part coffee cake, part shortcake creation. Over the holiday weekend I enjoyed polishing off the cake left over from the shoot as both a breakfast treat and later as a dessert, with a scoop of vegan vanilla ice cream topped with some fresh cut and sugared plums. 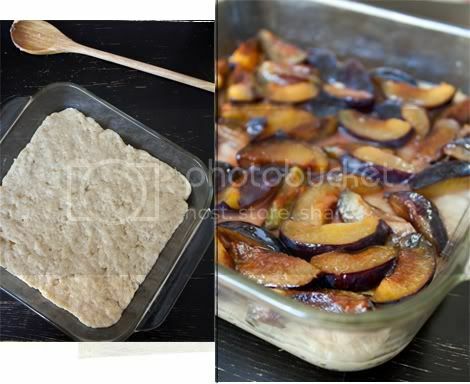 Rustic Plum Pie Coffee Cake is so quick and easy to make; and you would never know that it's vegan. This is definitely one of those recipes I'll keep in my arsenal to serve the next time I have omnivorous guests staying over (so that I can totally fool them, and surprise them when I tell them it was vegan after they've eaten it all). To start: Preheat the oven to 350°F and lightly grease an 8 x 8 baking dish. Set the greased baking dish aside. 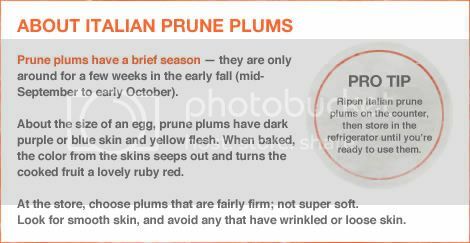 Prepare the plum filling: Halve and pit the plums. 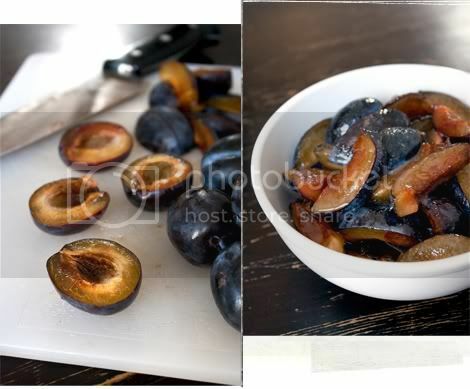 Cut plums into 3/4-inch-thick wedges and in a medium bowl toss with the sugar, cornstarch and lemon juice. Set aside in the refrigerator. Make the batter: In a small bowl, add the apple cider vinegar to the soymilk and whisk. Set aside for a minute or two, allowing to curdle. In another small bowl, combine the cornstarch and water (it will look like milk when it's all mixed together; and you may need to stir the mixture again when you're ready to use it because the cornstarch will separate from the water if left to sit). In a large bowl, combine the flour, sugar, baking powder salt, cinnamon and allspice and mix well. To the dry ingredients add the oil, soymilk and vinegar mixture, cornstarch and water mixture, and vanilla. Fold the batter until just combined. 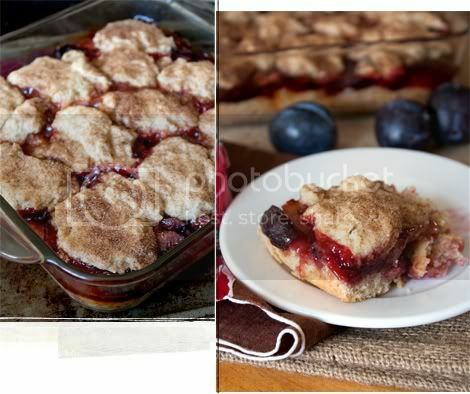 You'll end up with a thick, nearly doug-like batter that will hold the plums nicely and keep them from sinking to the bottom of the baking dish. Prepare the coffee cake: Spread 1/2 of the batter in the bottom of your greased baking dish. Add the plum filling over the top and spread evenly. Spoon the rest of the batter over the top in clumps, leaving some of the plum filling showing through. Sprinkle the cinnamon and sugar mixture over top. Bake for 50 minutes to 1 hour or until a toothpick inserted into the center comes out clean. Remove coffee cake from the oven and let cool before serving. And the best part? It just as good, if not better the next day; even after having been refrigerated and reheated in the microwave.